Colombia “Buena Vista” Pitalito (Micro Lot). Finca Buena Vista is in the small village of El Guamal, in the Pitalito Municipality of Huila, Colombia. Faiver Fajardo Renza owns and runs this very small 1 Hectare (approximately 2.5 acres) farm. 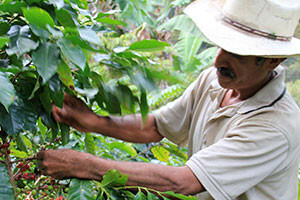 He grows a mix of Castillo and Colombian Typica trees. This season, he produced just under 1000lbs total of green coffee, which we’ve purchased all of, making this the first Riviera Exclusive coffee! Dark chocolate, ripe plum, and cola with slightly spicy & herbal notes.